Four days after the shoot down of flight MH17 over Eastern Ukraine, I found myself standing at Gate G3 in Amsterdam’s Schiphol airport waiting to board Aeroflot flight SU296 for the relatively short three-hour flight to Moscow. This was a business trip and I was going to be spending five days in Moscow. Some people familiar with aviation probably know that Aeroflot, the national airline of Russia, has had a troubled history. Back in the 80s and 90s Aeroflot had a safety record so poor the airline was aptly given the nickname “Aeroflop” by travelers from around the world. Their outdated Soviet-built airplanes were falling out of the sky left and right. If you don’t believe me, take a look at the Aeroflot Wikipedia article (link). The list of Aeroflot plane crashes from 1960 to 1999 is so long that it is broken up into four separate articles, one for each decade. 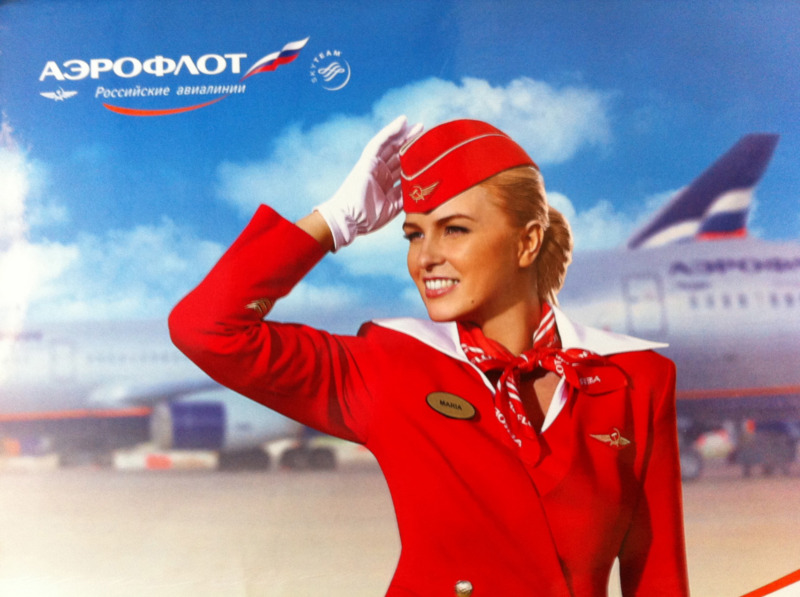 Fast forward to 2014 and Aeroflot has a reputation of being one of the best airlines in Europe (link). With a modern fleet of Airbus and Boeing aircraft, Aeroflot flies to over fifty countries spread across four continents. They have only had two plane incidents since 2000, and both of those had zero fatalities. Despite their new reputation and improved safety record, the increased tension between Russia and the West still left me slightly more nervous than usual. This was my third trip with Aeroflot. It was on an A320 and was manned by a crew of six. But unlike my other flights, this time I was given a rare opportunity to rub elbows with Russia and Europe’s elite up in business class. Or is still called first class? Is there even a difference? That’s a topic for another discussion. My nerves were instantly calmed as I sank back in the cocoon of pillows and blankets on my large royal blue seat, which I nicknamed “my czar throne”. Natalia, a tall, blonde, and stunningly beautiful flight attendant dressed in a bright scarlet uniform walked over and offered me a glass of champagne, and then another, and then another…. no drab Soviet uniforms here! Over the course of the flight my meal of choice was served in multiple courses and I had a six page wine and spirit menu to choose from. I was even given not one, but two pieces of cheesecake for dessert! Portable screens were finally handed out for watching movies and TV shows. For three hours I felt like a king. But remember, I’m just a simple engineer with less than two years of work experience. It is not often that I find myself in the front of the plane; but when I do, I thoroughly enjoy it! Even on previous Aeroflot flights though when I sat in economy with my fellow commoners, the level of service was fantastic. The boarding was quick and painless, and we even received complimentary hot meals, something almost unheard on similar flights operated by other carriers. On all of my three-hour Aeroflot flights between Amsterdam and Moscow, whether it was in business or economy class, the service and comfort during the flight reminded me of that usually seen on long-haul intercontinental flights. To get some third-party opinions I asked two of my fellow business class travelers on this flight what they thought of the airline. Punctual arrivals are understandably important for the typical business passenger whose schedules are usually an endless parade of meetings, appointments, and dinner functions immediately upon landing. I’ve flown on most of the large European carriers and have to admit that he had a valid point. So there you have it. It wasn’t just the champagne and beautiful flight attendant gently swaying my opinion. Aeroflot really is one of the better airlines operating in Europe. Long gone are the days of rickety Soviet airplanes plunging to the ground. Besides their famous hammer and sickle logo, it seems Aeroflot has successfully shed any trace of their former “Aeroflop” self. They have successfully rebranded themselves and have the modern fleet and superb service to back it up. What's your favorite airline to fly with? What separates them from other airlines? Leave a comment and tell us about your experiences.